It’s hard to believe that this time last week we were at the CLA Game Fair on the stunning grounds of Ragley Hall in Warwickshire. The sun shone on Friday making it very hot – luckily both of our stands were on corners so that we were able to open 2 full sides, which allowed a nice cool breeze to flow though – a welcome relief for staff and customers! Saturday and Sunday were cooler and cloudier, and busier than the Friday. There was a great atmosphere all round the grounds of the Game Fair, with people enjoying everything it had to offer. Now we are back, just about recovered, and already looking forward to our next show which is Chatsworth Country Fair 30th August – 1st September. If you’d like to see some pictures from our time at the 2013 CLA Game Fair, you can view them on our Pintrest board here. 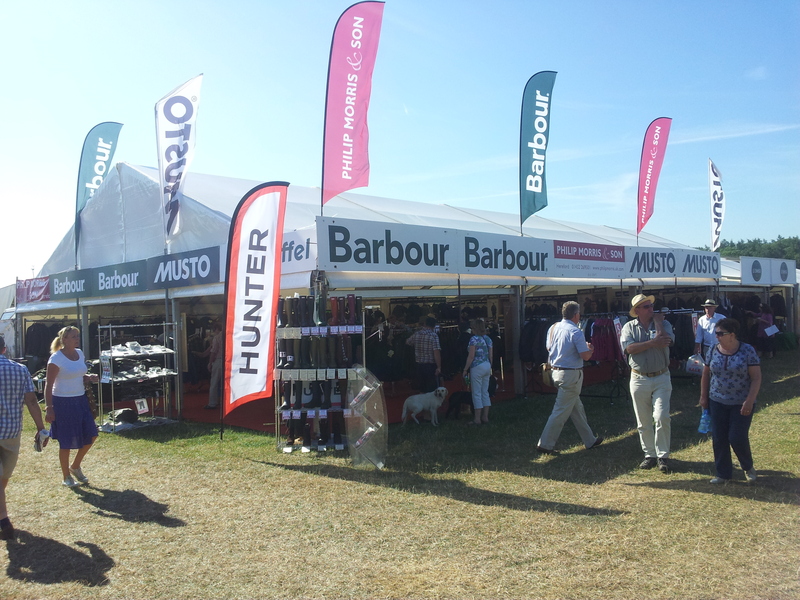 barbour, CLA, CLA Game Fair, hunter, Le Chameau, Musto, Ragley Hall, Sch?ffel, Warwickshire. Bookmark. I have two. One is 20+ years old and tattered from wenriag it riding and foxhunting. I wear it as is. I do re-wax it, but those holes are my battle scars! My husband bought me a new one last year to wear around town. It still feels too new though. For those looking on ebay, it’s best to check in the summer. There are far less people looking in the heat of the summer and you can find a great deal.